We’d love your help. 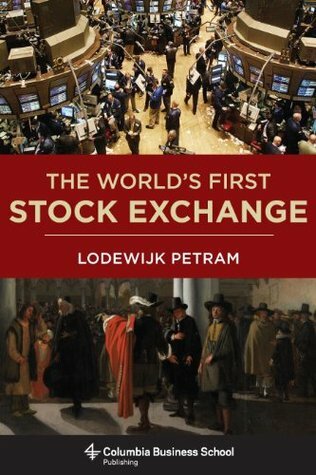 Let us know what’s wrong with this preview of The World's First Stock Exchange by Lodewijk Petram. The launch of the Dutch East India Company in 1602 initiated Amsterdam's transformation from a regional market town into a dominant financial center. The Company introduced easily transferable shares, and within days buyers had begun to trade them. Soon the public was engaging in a variety of complex transactions, including forwards, futures, options, and bear raids, and b The launch of the Dutch East India Company in 1602 initiated Amsterdam's transformation from a regional market town into a dominant financial center. The Company introduced easily transferable shares, and within days buyers had begun to trade them. Soon the public was engaging in a variety of complex transactions, including forwards, futures, options, and bear raids, and by 1680 the techniques deployed in the Amsterdam market were as sophisticated as any we practice today. To ask other readers questions about The World's First Stock Exchange, please sign up. This was a great book detailing the origin of the Amsterdam stock exchange. I've to confess, I'm interested in the world's first stock exchange, like most people who aren't Dutch, due to having read about it in Neal Stephenson's The Confusion. Petram is a Dutch historian and this book first appeared in Dutch, but this translation work is superb. He does a great job is detailing the origins of such financial derivatives as repos and options by tracing their origins to the Amsterdam Exchange. Even This was a great book detailing the origin of the Amsterdam stock exchange. I've to confess, I'm interested in the world's first stock exchange, like most people who aren't Dutch, due to having read about it in Neal Stephenson's The Confusion. He does a great job is detailing the origins of such financial derivatives as repos and options by tracing their origins to the Amsterdam Exchange. Even though I'd consider myself somewhat of an illiterate when it comes to all matters finance (something I'm trying to remedy), I found the book to be very interesting and well written. Petram focusses on the human aspect of the trading, and his research into the archives is immaculate. He dutifully recounts the various deals done by the traders, letters written to friends, bonds from the United Republic (as the Dutch republic was then known) and even writs issued by various courts (the Hague was already active). Overall, it makes for a compelling and fascinating image of what share-trading --including double-crosses, going incommunicado and suing your friends for all their worth-- in the 17th Century would have been like. Petram cheerfully approximates 17th Century money into modern-world money, usually by using Amsterdam real-estate as a benchmark. Portuguese Jews, who made the Republic their home after being expelled from Iberia, regularly make an appearance and they are some of the most active traders on the floor. Since this is a history of the Stock Exchange only, I can't complain that it doesn't try to deal more with contemporary Dutch history (even though, they are obviously intertwined). The crashes of 1672 and 1688 due to the wars with the French are probably only two cases where Petram deals with happenings outside of the world of finance, and background in 17th Century politics might help readers here. The tulip mania too is not much discussed, except the repercussions it had on share traders and the kind of safeties they tried to incorporate so that they wouldn't go the way of the bulb-traders. Overall, this a well written, cheery and informative book. But this is a history, and as Petram mentions, 17th Century financial practises are not applicable to the modern world, therefore this book is of use only to the history buffs. A quick and easy introduction to the history of the Amsterdam stock exchange in the seventeenth century. The first book to discuss a stock exchange was written about its activities in the late seventeenth century, and to some extent this book is meant to be an independent study of that stock exchange, ostensibly with a view to evaluating the value of the earlier book. 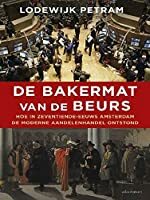 The book is organized by chapters on broad topics like "speculation" and "information", using specific anecdotes to illustrate th A quick and easy introduction to the history of the Amsterdam stock exchange in the seventeenth century. The first book to discuss a stock exchange was written about its activities in the late seventeenth century, and to some extent this book is meant to be an independent study of that stock exchange, ostensibly with a view to evaluating the value of the earlier book. One reservation I'd have about this account is that it really is written from the perspective of assessing the past in terms of present practice. On the whole this isn't too much of a problem, but sometimes one finds odd passages like the one trying to "explain" why the Dutch didn't use "margin accounts" the way people do today (pp. 198-99). The obvious answer that the very notion didn't occur to them comes first, but then there are various theoretical suggestions for why they might have preferred not to act like people today. But why in the hell should they done so if it never occurred to them to do something that wouldn't exist for centuries? It's looking at history back to front to say, "Why aren't they like us?" The better question is, "Given their circumstances, why did they chose to behave as they did?" Anyway, the Amsterdam exchange was an unusual beast. It only traded in shares of the Dutch East Indian Company, and no other shares were traded (it was the English who from the 1690s on who took the matter to the next stage by founding numbers of public companies with shares traded on the London exchange). Within their comparatively narrow bounds, the traders of the Amsterdam exchange quickly developed practices that are rather similar to those of the present day. One thing I might say as a non-stock trader is that while the author did a pretty good job of explaining what the general practices were/are, at times it took a bit of pondering to figure out what was going on. I received this book through Goodreads' First reads program. The World's First Stock Exchange describes the rise in trading of shares in the Dutch East India Company (Vereenigde Oostindische Compagnie, VOC) in Amsterdam (and other cities in the Dutch Republic), primarily during the 1600s. Lodewijk Petram begins most of the chapters with a short description of some aspect of trade in the market. This is generally followed by a deeper investigation into the area and some discussion of the ramifica I received this book through Goodreads' First reads program. The World's First Stock Exchange describes the rise in trading of shares in the Dutch East India Company (Vereenigde Oostindische Compagnie, VOC) in Amsterdam (and other cities in the Dutch Republic), primarily during the 1600s. Lodewijk Petram begins most of the chapters with a short description of some aspect of trade in the market. This is generally followed by a deeper investigation into the area and some discussion of the ramifications in terms of the history of stock exchanges. The first two-thirds of the book were more entertaining than one might expect from the subject. By the last third it maybe gets a little too wrapped up in the more intricate aspects of 17th-century trading or the dismal losses a few individuals suffered by taking advantage of some of the more risky practices during some of the worst down-turns in prices ever experienced in the market. The similarities to modern markets and modern economic downturns may be another reason the last third of the book felt less like entertainment and more like a cautionary tale too long ignored. The translation is excellent, though I did find it odd that the word "welsh" was used repeatedly where a less potentially offensive word would have served just as well. ‘The World’s First Stock Exchange’ is more than a ‘to-read’ book that is accessible to those seeking well-researched background information to historical fiction; it’s a ‘must read’ for anyone pondering the workings of contemporary stock markets and the reasons for volatility. This was my purpose for reading Loedwijk Petram’s enlightening and absorbing examination of what is effectively the origin of modern finance. The insights provided enabled me to complete research that proposes that contemp ‘The World’s First Stock Exchange’ is more than a ‘to-read’ book that is accessible to those seeking well-researched background information to historical fiction; it’s a ‘must read’ for anyone pondering the workings of contemporary stock markets and the reasons for volatility. This was my purpose for reading Loedwijk Petram’s enlightening and absorbing examination of what is effectively the origin of modern finance. The insights provided enabled me to complete research that proposes that contemporary stock market volatility is as much a result of the Dutch East India Company’s innovative business model as behavioural economics, contemporary financial practices and technology or regulation. The origin of the stock exchange is surprising (more accidental than planned) and, far from being a curiosity that is irrelevant to contemporary life, I believe this knowledge is essential in explaining the structure of modern finance. Students who examine the logic behind the original stock exchange place themselves in the best position to identify flaws in the contemporary system. So, certainly read this as an extension of your love of fiction from the Golden Age and be captivated by the atmosphere of doing business in the era, but also read it if you are interested in economics and finance as a student or professional and especially if you are a regulator attempting to stabilise contemporary markets. The great thing about this book, if you are reading for research purposes, is that it is as absorbing and atmospheric as fiction. For those who love Financial History this book is a gem. Just like a detective, the author searched through old correspondence and files in order to put together the stories told in the book, which he intertwines and explains along with the historical context and with some quotes from the first known book about the Markets: Confusión de confusiones. The stories collected from these records and letters are great and he narrates them in a very entertaining way. These stories range from the use of d For those who love Financial History this book is a gem. Just like a detective, the author searched through old correspondence and files in order to put together the stories told in the book, which he intertwines and explains along with the historical context and with some quotes from the first known book about the Markets: Confusión de confusiones. The stories collected from these records and letters are great and he narrates them in a very entertaining way. These stories range from the use of derivatives, fraud, insiders, insider trading, conflict of interest, regulation, naked short selling, repos, conspiracies, manipulations, blame others for our bad investments, etc. Sorry, nothing new. 주식회사가 발생한 모습은 당시 네덜란드가 가진 시대적인 필요성에 따른 것이다 . 도시 중심의 이탈리아 국가들과 국가 중심의 영국의 중간 지점에서 도시 중심이면서도 국가 적인 필요성에 따라 만들어 진것 이 VOC 이다 . 영어로 보면 the United East India Company 정도가 되겠는데 , 의회가 승인한 정관이 있었기에 Charter 가 정관이었던 것이다. 최초 주식 거래는 가 당시 평균 수명인 50년 동안 지분을 보유하여야 하되 전매를 허용하게 되었기에 발생하였고 이것은 증권 거래소가 생기게 되는 이유가 된다 . 거래소가 생기자 투기 거래도 생기게 되는데 이작 드 메어의 경우 에는 소액 주주 청원을 통하여 본인의 의견을 주장 하는 이들과 충돌 하기도 했다 . 투기에 대한 우려는 규제도 만들게 되어 과부 와 고아를 보호하는 것이 타당 하다는 의견 으로 모아 진다. 페르낭 브로델 의 "물질 문명 과 자본주의" 이후에 암스텔담 의 상업이 번성 하는 단면을 생생하게 보여주는 것이 이책의 매력 이며 당시 세계 최강국 이던 스페인의 압박 으로 유태인 등 의 상업 세력이 엔트 베르펜을 떠나 암스텔담에 자리 잡고 인도 무역 을 위한 회사를 세우고 조직화 하며, 대외적인 힘을 결집하고자 공기업 형태 에 유사한 전매 회사를 만들되 국민 누구나 투자 할 수 있도록 한 것이 voc 의 배경 이다. This was a solid historical work on the earliest stock exchanges which aided the rise of a largely unremarkable country into a powerhouse financial power that would often swing and shift geopolitical balances long after the Dutch had peaked in financial and naval strength. This book also proved a great historical supplement to the backdrop of David Liss's strong historical novel The Coffee Trader. Heel interessant om te zien hoe een aantal financiële instrumenten zo lang geleden al bedacht en dagelijks verhandeld werd. De anecdotes over verschillende handelaren zijn smeuïg genoeg om het verhaal niet alleen maar droog finance-technisch te maken. Daarbij vond ik het wel leuk om en-passant wat geschiedenis les te krijgen over Willem III, Johan van Oldenbarneveld, Michiel de Ruyter en nog wat van die namen die je wel kent, maar niet meer weet wie dat waren en wat ze deden. 신용을 바탕으로 한 선도거래(Forward Trading)이 많았는지, 왜 주가가 움직였는지 등을 역사적 배경을 바탕으로 쉽게 설명해준다. 저자가 찾은 자료에는 대부분 무미건조한 사실들만 나열되어 있었을 텐데도 그걸 이렇게 몰입할 수 있는 이야기로 만든 능력이 대단하다. 다만 최소 거래단위인 3000길더와 장부상 시세 단위 100길더는 다른 말로 바꿔서 설명했더라면 좀 더 글이 간결해지지 않았을까.